Nancy Holmes, born in Lake Charles, La. and McNeese State University graduate, and Nancy Kirby, North Louisiana born and LA Tech graduate, are turning their coffee roasting hobby into a career and setting roots in Lake Charles, La. to grow their business - Acadian Coffee Roasters, the first and only certified organic coffee roaster in Southwest Louisiana. Our name isn’t just loving what we do, but expressing who we are and where we come from. Acadian Coffee Roasters is a micro-roaster that offers strictly 100 percent roasted Organic, Rain Forest Alliance and Fair Trade Arabica beans. The micro roaster takes pride in offering top grade beans from around the world to make your coffee experience one that keeps coffee drinkers coming back. When deciding on a name for the business, including “Acadian” in the name was important as Holmes is of Acadian descent. “Our name isn’t just loving what we do, but expressing who we are and where we come from. Coffee has been a part of my life from early childhood – the best was ‘coffee milk at Maw’s house’,” said Holmes. 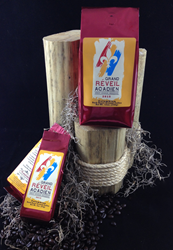 Acadian Coffee Roasters is also proud to announce that they are the official coffee sponsor for the Grand Réveil Acadien (Great Acadian Awakening) Festival. This week-long event celebrates the Acadian culture and heritage in South Louisiana. To find out more about the Great Acadian Awakening, visit http://www.louisiane-acadie.com. The micro roaster pays careful attention to all stages that go into producing the perfect roast, the perfect blend and the perfect flavor. Roasting small batches to order guarantees the freshest coffee possible. There is an array of options available for coffee drinkers, such as gourmet blends (Early Bird Morning Blend), flavored blends, Swiss Water Decaf, single origin and seasonal blends. Some of the flavored blends are amaretto, Chocolate Pecan Pie, Cinnamon Roll and Hazelnut. The single origin options include Colombian, Costa Rican, Guatemalan, Mexican Chiapas and Nicaraguan. Acadian Coffee Roasters also offers numerous gift basket arrangements that will make any coffee drinker smile. Additionally, Acadian Coffee Roasters offers wholesale pricing, private labeling and special packaging for events such as weddings, showers and corporate events. Acadian Coffee Roaster products are currently available for purchase at the roaster’s warehouse (2908 Hodges St. Lake Charles, La. 70601), PaperSmith (2925 Ernest St. Lake Charles, La.) and every Tuesday at the Cash & Carry Farmers Market (801 Enterprise Blvd. Lake Charles, La. 70601). Their chocolate pecan pie and cinnamon roll coffee is also available at Pronia’s Deli and Bakery (3201 Kirkman St. Lake Charles, La. 70601). Recently, they have been added to the coffee line up in select Market Basket Grocery stores which include the Lake Charles Lake St. and Nelson Rd. locations, as well as locations in Moss Bluff, La., Sulphur, La., Beaumont, Tx., Port Netches, Tx. and Bridge City, Tx. The organic coffee roaster is actively working on getting into more local grocery stores and shops. For more information on Acadian Coffee Roasters or to purchase coffee and gifts online, visit http://www.acadiancoffee.com.